At workshops, institutes, etc. I see lots of classes on “Viola for violinists”. What about the reverse? If you have a child who only plays viola, would you introduce them to violin at some point? When, and how? My child already reads treble clef pretty well, and isn’t interested in dropping viola, just adding violin. A 3/4 size violin would be basically the same size as the viola we have now. If reading treble clef isn’t an issue, and the size of the instrument is the same, what kinds of differences would we expect? What would “learning” the violin actually consist of, at this point? 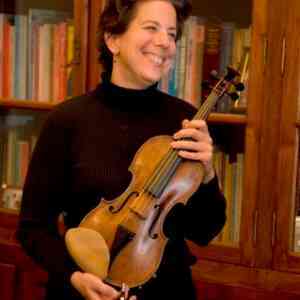 One of their purposes is just that—teach violin to violists and teach viola to violinists! My daughter didn’t want to drop the viola either, but she drooled over her friends’ violins. Betsy Stuen-Walker has published a terrific book that my daughter used to learn to read treble clef: Treble Clef for Violists. After that, she was able to pick up a violin and find the notes by ear, transfering what she knew of treble clef and finding the notes in their “new” positions. Now it’s just practice. She currently has a 13 inch viola and a 3/4 violin. The violin is a good bit lighter in weight. The bow is also lighter. Fractional violas and violins are similar enough in size that she doesn’t have much adaptation to do with her left hand. The one surprise was that the distance between the bridge and the fingerboard is a bit shorter on the violin, even though the instrument is as long as her viola. She must really pay attention to her point of contact to avoid bowing over the violin’s fingerboard.